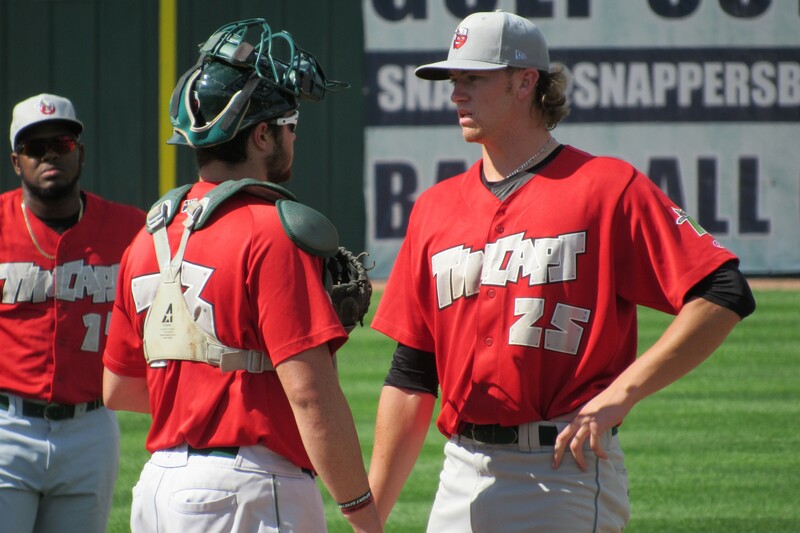 Fort Wayne TinCaps RHP Chris Paddack is out for the rest of the season after being diagnosed with a torn ligament in his pitching elbow. The San Diego Padres prospect last took the mound Monday in Beloit, but didn’t end up throwing an official pitch after being removed while warming up in the middle of the 1st inning. Padres general manager A.J. Preller told reporters late Saturday that Paddack likely will undergo Tommy John surgery and miss at least a year as he recovers. It was a breakthrough season for Paddack, whom the Padres acquired from the Miami Marlins on June 30. He went 2-0 with a 0.95 ERA, 48 strikeouts and two walks in 28.1 innings (six starts) in the South Atlantic League before joining the TinCaps. He made three Midwest League starts, posting a 0.64 ERA with 23 strikeouts and three walks in 14 innings. The Marlins placed former TinCaps pitcher Colin Rea on the disabled list after he left Saturday’s game early with an elbow sprain. It was Rea’s first start for the Marlins since the right-hander was traded from the Padres in a seven-player swap Friday. Rea was taken out of the game after 3.1 innings; he had given up only one hit and struck out four batters. Rea pitched a total of 146 innings for the 2012-13 TinCaps, going 7-11 with a 3.51 ERA, 118 strikeouts and 69 walks in 47 games (22 starts). In addition to Rea, the Marlins acquired right-handed pitchers Andrew Cashner and Tayron Guerrero in the seven-player trade. The Padres received right-handed pitchers Jarred Cosart and Carter Capps (the latter of whom is recovering from Tommy John surgery), along with two minor-leaguers, first baseman Josh Naylor and RHP Luis Castillo. Guerrero made 29 relief appearances for the 2013-14 TinCaps, going 6-2 with a 1.59 ERA, one save, 46 strikeouts and 20 walks in 39.2 innings. Capps made four starts for the 2011 Clinton LumberKings, going 1-1 with a 6.00 ERA, 21 strikeouts and 10 walks in 18 innings. This entry was posted in Clinton LumberKings, Fort Wayne TinCaps, Midwest League, South Atlantic League. Bookmark the permalink.